Get 6 Roses instead of 3 with the Standard size bouquet! Treat a loved one to a beautiful blend of blackcurrant hues. 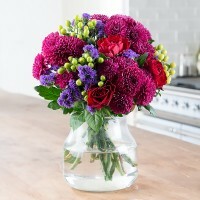 This bouquet combines lollipop chrysanthemums, red roses, green hypericum berries and blue statice. 100% extra roses offer available for Standard bouquet only.